The Business Times published an opinion piece by Hornbills’ associate, Mr Brendan Forde, on 6 October 2015. 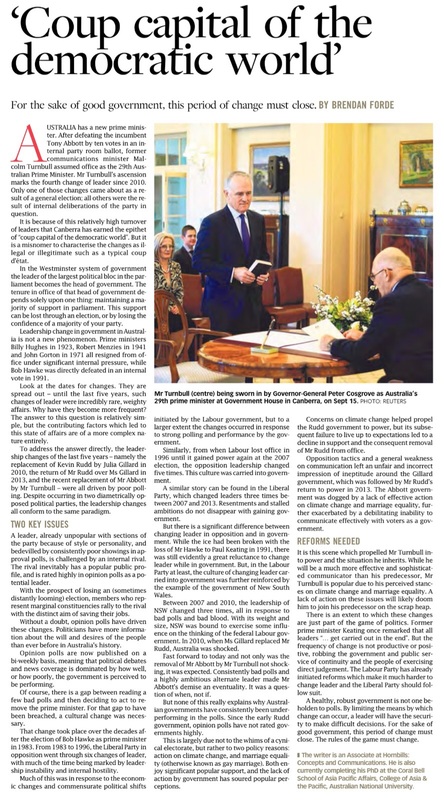 The piece discusses leadership change in Australia, following the ascension of Malcolm Turnbull as Prime Minister after ousting the incumbent and fellow party member, Tony Abbott. Originally entitled “Death by a thousand polls”, the piece noted the role that opinion polling has had in exacerbating issues contributing to leadership change.